I may have forgot to mention it here, but these past four days I went away. I was in Volos to see the boyfriend, spend some time with friends and also to meet with my consulting professor, in an attempt to finally get my degree in a couple of months. He is one of my favourite professors. He specializes in architecture history and, moreover, his name translates as "column". 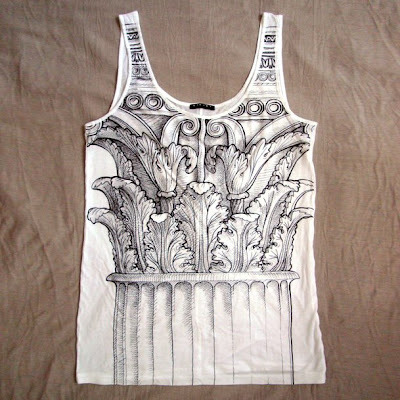 So, what's more fitting to wear at such a meeting, than a simple white tank top printed with the capital of a Corinthian order column? "The Corinthian order is one of the orders of Greek and Roman architecture, characterized by a slender fluted column and an ornate capital decorated with acanthus leaves and scrolls. Although of Greek origin, the Corinthian order was seldom used in Greek architecture. The other two orders were the Doric and the Ionic. Vitruvius wrote that the Corinthian order had been invented by Callimachus, an architect and sculptor who was inspired by the sight of a votive basket that had been left on the grave of a young girl. A few of her toys were in it, and a square tile had been placed over the basket, to protect them from the weather. An acanthus plant had grown through the woven basket, mixing its spiny, deeply cut leaves with the weave of the basket." Got it last year from Sisley and it's one of my favourite tops. I feel so architecture-savvy wearing it! Stupid, I know. Απο τις πιο ιδιαιτερες μπλούζες που έχω δει...Τα σπάει! sigoura i mplouza teriaze apolita me tin peristasi! !einai poli oraia, san na exei zografistei me molivi!! Beautiful top! I love it when fashion and architecture meet. totally! I hope he appreciated it! love this tee!!! kai den to pisteua otan mou eipes oti einai sisley!!!! i do that,too sometimes! match clothes with the circumstances!!!! wow...to vrisko poli omorfo..kpoli prototipo..
elpizo na to doume kforemeno kapia stigmi..8a 8ela na 3ero pos to sindiazis..
teleia mplouza!!! mou aresei pou eina illustrated!!! hope u had a great time!!! Soooo beautiful! Πολύ ιδιαίτερη, πράγματι! Ελπίζω να άρεσε και στον κθηγητη!